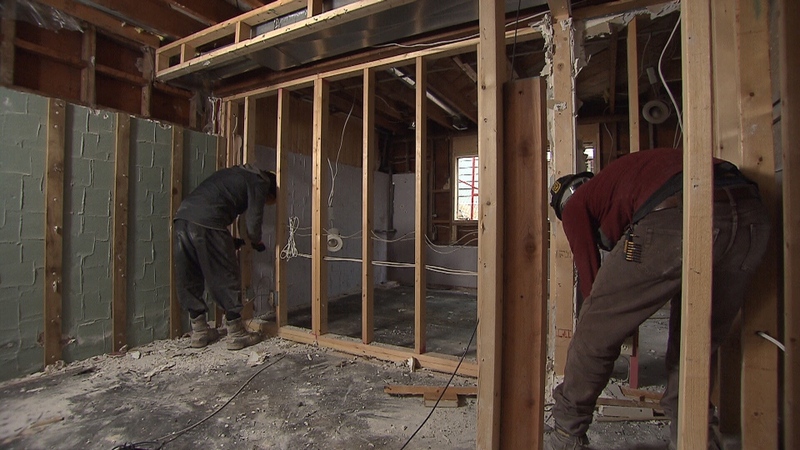 A new Vancouver company says it's the first in Canada to take old homes apart entirely by hand so that almost all of the materials can be salvaged. "We take the whole building down by hand, including the whole frame," said Adam Corneil, the co-founder of UnBuilders Deconstruction. Corneil and business partner Tony Panteges carefully "reverse engineer" homes so that 90 per cent of the lumber, metal and other materials can be reused. Most of what’s salvaged is donated to Habitat for Humanity, a non-profit that works to create affordable housing. The old-growth lumber is also used to make furniture, stairs and flooring or sold to local shops that work with salvaged wood. "It's a new service yet it's probably the oldest service there is," Corneil said. "If you go back to the 1920s, 1930s we never just chucked away full houses or materials like we do today." Other deconstruction companies separate the insides of the home by hand, but bring in heavy machinery to tear down the structure itself. That means the material can be recycled, but not reused. In Vancouver, those rules don’t apply to homes built after 1940. Each municipality in Metro Vancouver has varying rules about what how much of a home has to be recycled. With the region going through a housing boom, that means mounds reusable material left behind by redevelopment projects are ending up in landfills. "Currently, we're taking down over 3,000 houses a year in Vancouver and we're basically dumping them in the dump—all 50 tonnes of each house," Panteges said. "We're all really concerned about a plastic grocery bag, but no one seems to care about 50 tonnes of house." Corneil said deconstruction by hand also makes financial sense. While UnBuilders' services cost almost twice as much as traditional demolition, the owner of the home gets a tax credit for the assessed market value of the salvaged goods that helps offset the additional cost of deconstruction. In some cases, he said, the tax credit can be so big that hiring UnBuilders can end up costing less than a demolition over the long term. UnBuilders' rates are comparable to other deconstruction companies and that's before the tax credit. "What we're trying to show is that there's a better way and we can compete not only from an environmental standpoint, but from an economic standpoint," Corneil said. "What we're having to convince the homeowner on is whether they're willing to pay it forward by paying more for our service in advance, knowing that they're going to get savings over the tax seasons with their tax credit." While their methods might seem old-school, Corneil and Panteges say this type of deconstruction is the way of the future and are hoping to help make it an industry standard. "I think traditional demolition is something that, as people become more and more aware of just how wasteful it is, I think it's an obvious business practice that'll be dying down," Corneil said. "At the end of the day there's always a place for these materials, and it's not the transfer station." Workers are seen deconstructing a Vancouver home by hand in this image from March 2018.